Syria’s President Bashar Assad has signaled his readiness to cooperate with the new U.S. administration, but also indicated that his country won’t give up good relations with Iran, a German magazine reported Saturday. Barack Obama’s election has raised hopes for better ties between Syria and the U.S. after years of strained ties under outgoing President George W. Bush. Damascus has close ties with Iran, which the West suspects of seeking a nuclear bomb. “We are ready for any form of cooperation that is also helpful for America’s relations with other countries,” he said, according to the report. Assad said he did not believe Iran was seeking a nuclear bomb. And looking back at the Bush administration, he argued that the world situation has worsened in every way in the last eight years. Syria has for years maintained close ties with Hamas, one of several anti-Israel militant groups that Damascus supports to gain leverage in any future peace negotiations with Israel. Thousands of Gazans are fleeting their homes as the Israeli Army works to root out Hamas militants in Gaza City. Fighting is now in the city’s residential neighborhoods on Day 20, Thurswday, January 15, 2009. In Gaza, the dead now number over 1,000. Israel Air Force planes struck some 70 targets overnight, including weapons positions, rocket squads and a mosque in southern Gaza that it said served as an arsenal, the military said. President Assad of Syria asked both sides to agree immediately to a cease fire and then work out their cross border smuggling issues later. Israel insist on a regime to prohibit the re-arming of Hamas through the Gazan borders. But Syria is not trusted in Israel where it is often seen as an aid to Iran and militant anti-Israeli forces like Hamas and Hezbollah. Yesterday, Hamas seemed on the verge of agreement of an international 10 day cease fire brokered in Cairo, Egypt. Israel was to again consider the cease fire idea today. In Israel, Defense Minister Ehud Barak is known to favor a cease fire while Prime Minister Olmert is resisting. Haaretz reported that the disagreement is causing trouble in the Israeli war cabinet. Following press reports Wednesday that Barak wanted to see a humanitarian cease-fire, sources close to Olmert were quoted as saying that Hamas saw and heard what was going on in Israel and “draws encouragement” from this, concluding that Israel was searching for a way out of the military operation. “The irresponsibility of ministers – regardless of how senior they are – in leading private initiatives is unfortunate,” one of these officials said. But Arab nations trying to assist in the cease fire process were in disagreement how how and when to hold an Arab summit. Hamas spokesman Mohammed Nizal said Wednesday, “Is it possible to get into the third week of this Zionist aggression against Gaza and the Arabs can’t hold a summit for Gaza and to stop this aggression? 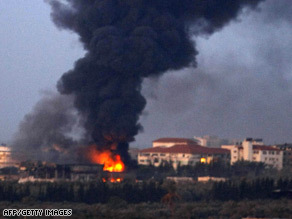 Smoke billows from Gaza on Thursday as fighting continued to rage. Witnesses say Israeli ground troops are advancing into crowded residential areas of Gaza City and thousands of terrified residents are fleeing their homes. Israeli troops backed by helicopter gunships, tanks and heavy guns thrust deeper into the city than ever before Thursday to seek Hamas fighters, they said. It wasn’t clear whether this would be a brief foray or signal a new phase in Israel‘s devastating offensive against Gaza’s Islamic Hamas rulers. Israel has balked at launching all-out urban warfare in Gaza City, where Hamas militants are more familiar with the lay of the land and Israeli casualties would be liable to spiral. Israel launched the offensive on Dec. 27 to stop militant rocket fire on southern Israel from Gaza. Palestinian medical officials say the death toll from an Israeli airstrike outside a United Nations school in the Gaza Strip has risen to 30. The attack occurred about 10 yards (meters) outside the school in northern Gaza. It was the second deadly Israeli attack to strike a UN school in the past few hours. Hospital director Bassam Abu Warda confirmed the 30 deaths from the second airstrike. In both cases, the schools had been used as shelters for people displaced by Israel’s offensive against Hamas militants. More than 500 people have been killed in the 11-day operation, including many civilians. A top U.N. humanitarian official has condemned the violence and demanded an investigation. Israel isn’t commenting. But it accuses Hamas of using schools, mosques and residential areas for cover. In Damascus, Syria, Bashar Assad told French President Sarkozy the Israeli assault on the coastal strip of Gaza was a “war crime” and an “aggression” that Israel must halt. You are currently browsing the archives for the Assad category.